The Malaysian International Chamber of Commerce and Industry (MICCI), since its formation in 1837, continues putting the interest and wellbeing of the business community as its core objective. MICCI traces its history from the formation of its ancestor, The Penang Chamber of Commerce and Agriculture 181 years ago. With that at heart, MICCI Southern Region organised the 2nd Members Networking Night or Fellowship Evening at Suasana Suites Johor Bahru with Menteri Besar Johor Datuk Osman Sapian attending as the Guest of Honour. In his welcoming address, MICCI Southern Region Chairman; Freddie Lee shared with all VIPs and guests that the Networking Night event was held to gather its members, build relationships and exchange information while fostering a closer relationship with the new state government. “In the past 6 months, arising from our active engagements with the current government, many positive changes have been put in place. One of the direct responses is the formation of the National Financial Crime Centre (NFCC). With this, the government is expected to save RM8 billion of revenue losses due to cigarette and liquor smuggling,” said Freddie. “It is important to maintain a friendly and amicable business relationship with all of our business partners and neighbouring countries. For the social and economic wellbeing of the people of both countries, I urge the government to move on with the BRT project with Singapore. I also propose the construction of a travellator connecting the causeway to help ease the congestion,” he added. Amongst the 100 guests present were MICCI President Datuk CK Tan, Singapore Consulate General Rajpal Singh and Indonesian Consulate General Pak Haris Nugroho. “As one of the most established business chambers in the country, we continue to lobby with the government for a competitive business environment with clear and fair policies. This is crucial especially in the challenging global economy at the current context,” said Datuk CK Tan, President of MICCI. 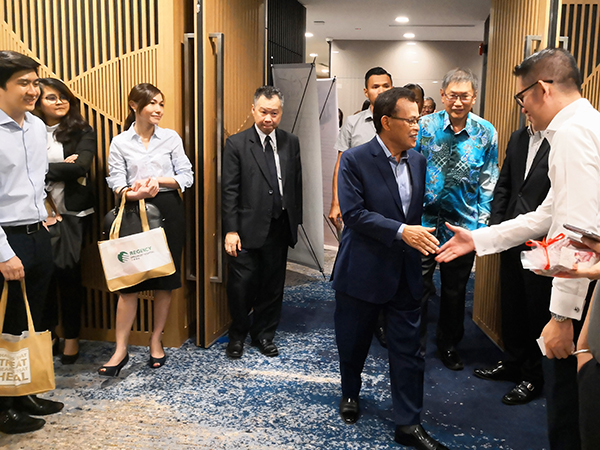 Menteri Besar Johor Datuk Osman Sapian lauded the efforts by MICCI while noting that the Chamber has continued to grow and is now a member of the International Chamber of Commerce with links to some 180 fellow Chambers worldwide. “Johor has some improvements to take care of mainly in terms of growth strategies and delivery and I welcome MICCI to contribute your ideas and feedback in our endeavour to bring prosperity to the state and Bangsa Johor,” said Johor Menteri Besar Datuk Osman Sapian. MICCI has about 1000 Corporate Members in Malaysia; representing the whole spectrum of Commerce and Industry from Multinationals to Small and Medium Enterprises. MICCI members provide hundreds of thousands of jobs to the citizens of this country and contribute a large percentage of the country’s Gross Domestic Product (GDP). Apart from the opportunity to mingle and strengthen their network, the members and invited guests were kept entertained by some performances and a lucky draw session.